Wedding favour – The traditional idea of gifting your near and dear ones with sweet little things for becoming a part of the wedding, has emerged as a trend in the modern style weddings. The potlis of sweets, bangles, and tokens of jewelry have been replaced with luxurious indulgences that treat the guests with love and beauty. From Haldi Ceremony to Mehendi, the wedding favours have become quite a priority as a token of love for the bridesmaids, groom mates, families, relatives, and friends. Breaking the cliché and leaving the predictable boring favours behind, here are some excellent ideas that are streaming hot across Indian weddings today. How about picking an on-trend wedding favour idea from here? The world is going Eco-friendly! To spread the awareness, and truly cherish the presence of your loved ones in making your wedding a happy vibe, gifting potted plants can be the ideal idea! The small potted plants like English Ivy, lavender, bamboo, orchids, amaryllis, peace lily, aptenia, etc are ideal choices to go for. You might also select herbs like holy basil, rosemary, lavender, etc in miniatures. Decorate them with ribbons and a wedding miniature card with a message for the loved ones. 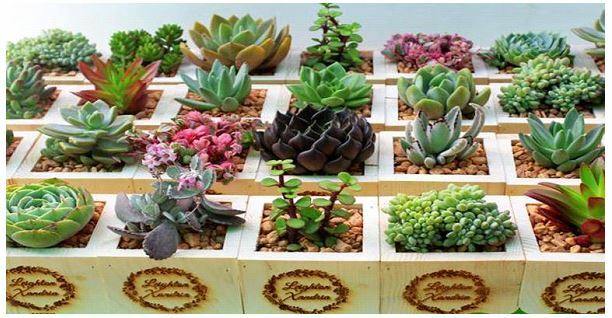 The potted plants act as antidepressants, air-purifying, and eco-friendly message for healthier, peaceful and rejuvenated living. 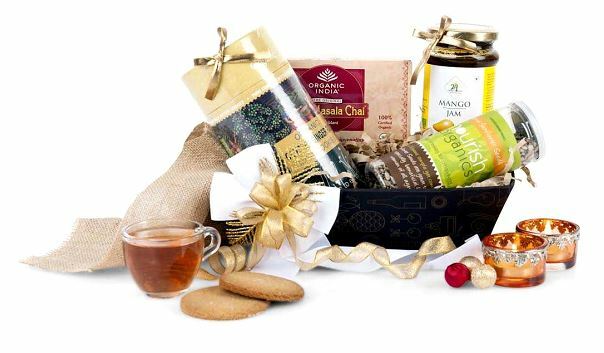 Luxury Indian weddings don’t miss out on treating their guests with luxury indulgences. And that is why the luxury skincare and wellness packages have been solicited favourites for weddings. 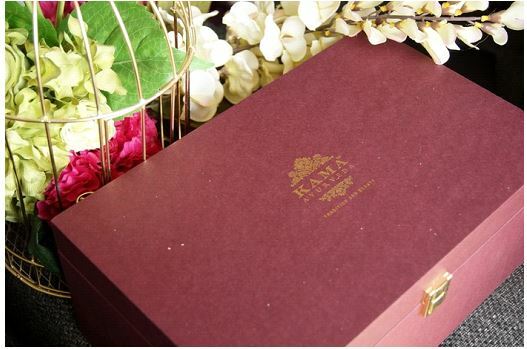 Some of the most promising brands like Forest Essentials, Goodearth, KamaAyurveda, etc provide for personalized packaging of wedding favours which includes items like essential oils, skin care products, aroma oils and essentials for a luxury feel. These impart the love and care that one needs in the most succulent way. Perfect for the guests who made up for a great wedding! Want to go a little quirky? How about some pop colour sunglass boxes, dupattas, shawls, and juttis? Yes, Indian brides are going crazy with assortments of quirky fashion items for the bridesmaids. These are so effortless and beautiful that they stand out. 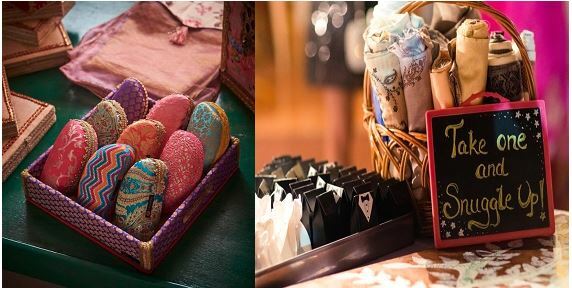 You can also include quirky brooches, shoes, bangles and more to treat the guests with some pop colour gifts. For a wedding that in itself is colourful – these can be just the right fit! Fashion in India is going traditional and handmade. Go back to the roots and find out the missing pieces of treasure for today. 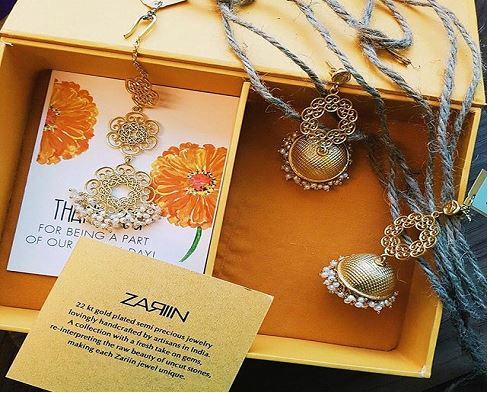 There are emerging numbers of handcrafted jewelry brands and handloom brands which deal with authentic, revering and unique fashionable items. Collect some pop handcrafted earrings, brooches, sarees, handkerchiefs or maybe just potlis with gifts to treat your guests. Add in some French crockery, wine classes or French rose for a luxury edition. You cannot go wrong with this one! Organic food has made it in India with a bash! From handmade granola, organic honey to freshly made chocolates, puddings, and coffee boxes – there is something for everyone. Organic assorted food box with all sorts of tasty treats are a big hit with Indian weddings today. These are personalized, handmade and organic. What more do you need to express just how truly special your guests have been to you! These trendy wedding favour bring out the idea of love, care and warmth carefully packed and presented to your guests. Let the celebrations begin! This entry was posted in Wedding Planning Ideas and tagged 5 wedding favour ideas, Best Wedding Planners in Mumbai, Dream Wedding, eco-friendly with plants, Handcrafted and Handlooms, luxury indulgences, Organic food, The Wedding Trunk, wedding favour, wedding favour ideas, wedding planners, Wedding Planners in Mumbai, wedding planning, wedding tips.